You have to have access to do anything. 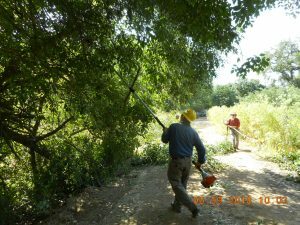 The Habitat Restoration Team needs access. 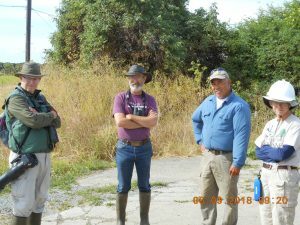 The agriculture fields for the Pacific Flyway stopovers need access. The viewing stations for the public need access. 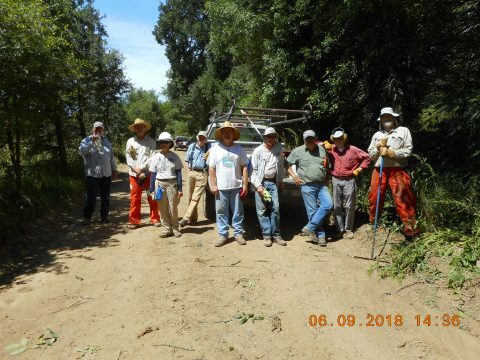 The Cosumnes River Preserve has literally miles of dirt roads to maintain and The Habitat Restoration Team helps keep those costs down by making room for the Big Equipment to get in to do the grading and apply a thin layer gravel to the road beds. Without these minimal treatments, we wouldn’t be able to work during California’s rainy season and the roads would be near impassable once the ruts have dried out becoming miniature canyons. 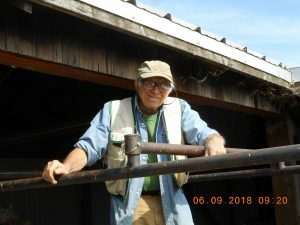 Pole-saws, chain-saws, gas driven hedgers, pruners, and loppers are prepped for use before we leave The Barn. 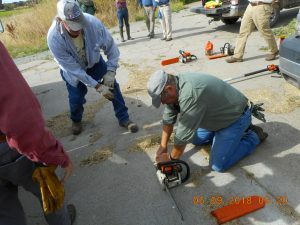 Mike Todd and Tom Johnson prep equipment while John Trochette stops by after his morning bird walk. Malon Picht watches from a safe distance. 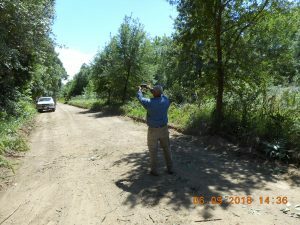 Every year HRT works on one or more stretches of road, cutting back 3 or more feet of the encroaching canopy from a very healthy forest. 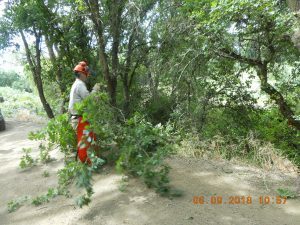 Philosophically, it’s a mixed feeling cutting back a healthy forest, but we can’t root out invasive aliens or replant natives if we can’t get to them. The Forest may have the last laugh because Mike and a few others commented (before we were even done) that they he was going to buy a BIG bottle of Tylenol the next time he goes shopping. I also heard mention of “a glass of wine and a hot bath” from somebody or was that just my imagination?